The basic idea behind the Custom Design FS104 Signature is pretty much the same as for all metal stands, but Custom Design has managed, with typical ingenuity, to find a new take on this by choosing both the pillar sizes and the exact design of the top and base plates. These are both skeletal, comprising just enough metal (4mm-thick steel plate, painted in textured black) to link everything together. 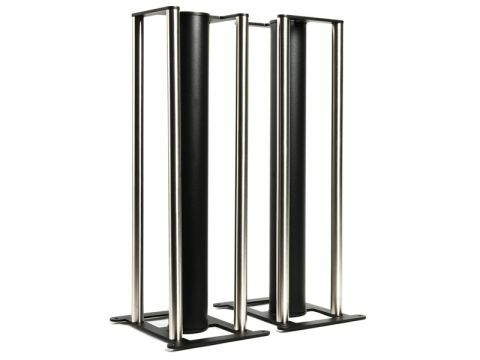 Of the five pillars, the central one does most of the supporting work and its 75mm diameter is judged sufficient by many manufacturers to function unaided in many speaker stands. In this case, however, it is assisted by the four 25mm 'satellite' pillars, very smart in the brushed chrome of our review sample, which add both bending and torsional rigidity to the assembly. Custom Design recommends filling the central pillar with 'inert' filler (£20-worth will do two stands), which we certainly endorse as the undamped pillar rings like anything. It would be difficult to get inert into the satellite pillars, but some kind of damping is no bad thing; we tried improvised methods in our tests with useful results. Without any such damping the sound is certainly solid, but it can be a little lively too, with some smearing of detail. However, even the simplest attempts to damp the stainless pillars can work wonders and at best this stand is a great choice for its combination of solid bass and neutral, uncoloured midrange. It really gets good results out of speakers, small and large, and excels in encouraging fine detail and precise imaging.